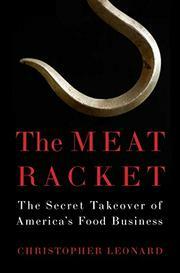 An engrossing report on the industrialized American meat business. Leonard, a fellow at the New America Foundation and former national agribusiness reporter for the Associated Press, debuts with a richly detailed examination of factory farming, which has reshaped small-town life for the worse in Arkansas, Iowa, Oklahoma and elsewhere, leaving a handful of huge companies with “unprecedented control” over the U.S. meat supply—most notably Tyson Foods, the biggest, which has $28 billion in annual sales with $780 million in profits. Using Tyson as a window on modern meat production, Leonard shows how the company has eliminated free market competition through vertical integration, buying up independent suppliers (feed mills, slaughterhouses and hatcheries) and controlling farmers through restrictive contracts. The strategy, soon a blueprint for other firms, worked first in the chicken business, then in the hog industry (some 90 percent of all hog farms disappeared), and now threatens the cattle business, where a minority of ranchers refuse to abandon their independence. As the author observes, all of this occurred out of sight of most Americans, who from the 1960s to ’90s knew only that meat was cheap and plentiful in fast-food restaurants and supermarkets. Now, cost savings from factory farming are slowing down. In the meantime, rural communities have been “chickenized,” with farmers dependent on the company in a bizarre, near-feudal system that forces many into bankruptcy. Sometimes, hopeful immigrants take over abandoned farms, only to face the vicissitudes of the least-profitable corner of the corporate meat business. Tyson’s “cost-cutting ethos and the lack of competition restrains income growth in rural America,” writes the author, and strong lobbying defeated the Obama administration’s recent attempts at reform. Leonard’s book traces the rise of Tyson, from its creation by former fruit farmer John Tyson in the Depression to the chicken evangelism of his son, Don, who spent 14 years convincing McDonald’s to add chicken to its menu and helped make chicken the nation’s most-consumed meat. An authoritative look at a ruthlessly efficient system.